When it comes to landscapes, the Middle Eastern country of Oman has it all: deserts, mountains, islands, and everything in between. The best part? You can camp anywhere you like. Here’s how to experience Oman by tent. When my friends called to tell me we were going to Oman, I was a bit hesitant. The Middle Eastern country had been on my must-see list for a while, and an airfare deal to Dubai (a short flight from Oman) made the trip more palatable—but I still had doubts. They had nothing to do with the country itself, but rather how my friends wanted to see it. Really. It turns out Oman, located on the Arabian Peninsula, is a country made for camping. It’s a gorgeously rich destination, both in culture and in landscapes. The jewel is its capital, Muscat, but there are riches to be found in the mountains, deserts, and coastline. The best part? Anywhere you can pitch a tent is fair game for camping. My friends and I had ten days to explore the country and, as with most trips, we were going to try to see as much as possible. We rented an SUV and packed it with a tent, sleeping bags, sleeping pads, a camping box with a few cooking items, and a cooler that we rented from our hostel in Muscat. Then, we stopped at the grocery store to pick up snacks, ingredients for our first few meals, and plenty of water before hitting the road. 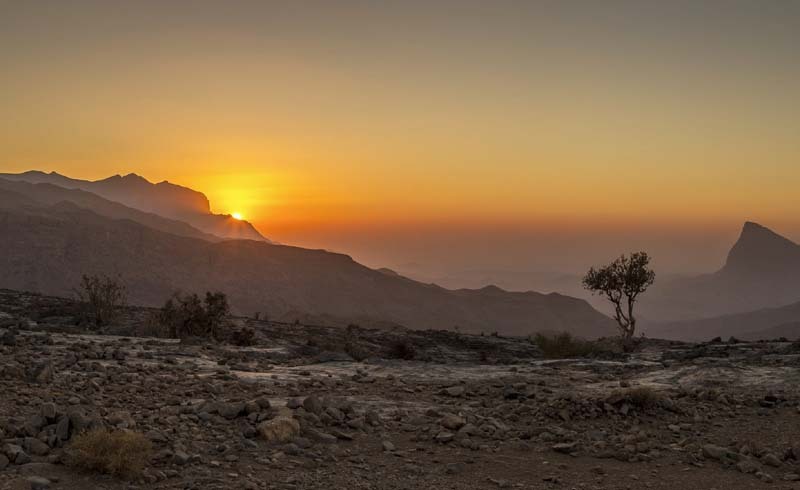 No matter what sort of landscape you enjoy, Oman is almost guaranteed to have it. We started at Jebel Shams mountain and pitched our tent near the edge of a gorge called Wadi Ghul, known as “The Grand Canyon of Arabia” or “Oman’s Grand Canyon.” This area gave us access to hike in abandoned villages that were cut into the cliff sides, and venture into nearby villages like Misfat Al Abriyeen for a bit of wandering. If you are more into beaches, Oman has almost 2,000 miles (3,219 kilometers) of coastline to explore, as well as gorgeous islands like Masirah, the largest in Oman. There are several resorts on the island, but I recommend setting up camp on one of the beaches, where you can watch the fishermen come in at sunset. Keep an eye out for camels, too: They stroll along the roads like they own the place. 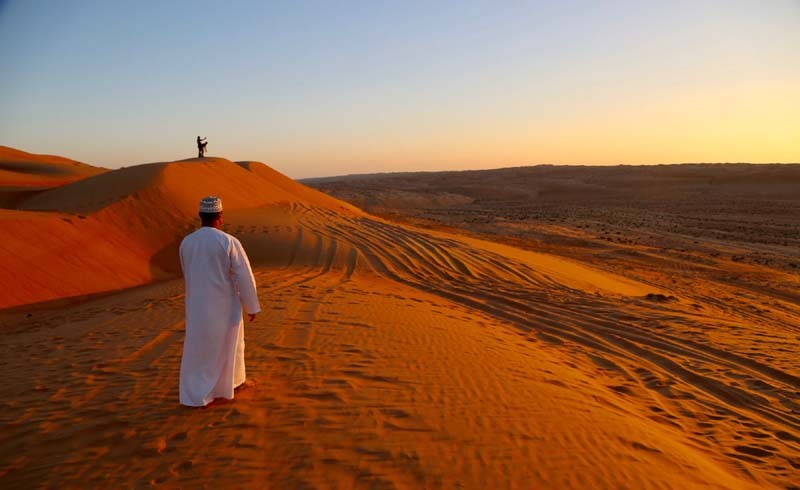 No visit to Oman is complete without a journey into the desert. We left the tent in the car and spent one night at Nomadic Desert Camp in Sharqiya Sands to get a taste of the Bedouin life. While there, we got to drive on the dunes (with a little help from the locals), take a camel tour, and enjoy a desert campfire complete with dates and cardamom coffee. Then there are the wadis, or valleys, where you can swim in cool, aquamarine water with the mountains as your backdrop. It’s also worthwhile to stay a night or two in a seaside village like Sur, enjoying meals of fresh-caught fish; and checking out the forts, castles, and mosques in areas like Muscat and Nizwa. It’s best to pack layers to prepare for Oman’s diverse landscape and climate: It’s hot during the day, and nights can get cool. It’s also best to be respectful of the local culture: My friend and I made sure to wear pants that covered our knees and shirts that covered our shoulders, including when we went swimming. For camping, bring a bag that’s water-resistant (at the off-chance you’ll experience rain), and that can be sealed shut to keep out the sand—like one of Eagle Creek’s No Matter What™ Duffels. Pack a quick drying towel to use after quick dips in the Arabian Sea. Organize your clothes and necessities in packing cubes to minimize the amount of space your things take up in your bag and make it easier to find what you need at each campsite. And throw in a set of travel ear plugs, too—just in case your tent mates are the snoring types. What’s your favorite adventurous camping location? Share in the comments!